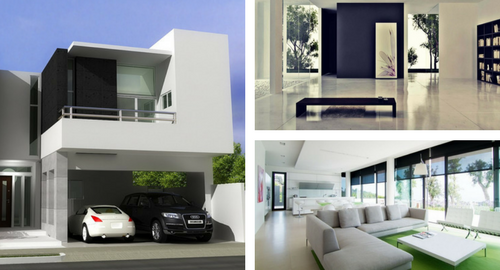 When it comes on minimalist home design the number one characteristic is the ‘less is more’ motto. You can also see it on the style that the design tends to use simple things but still appears beautiful to see. If you like this kind of style, then you can try to use minimalist theme to decorate your house. Of course you need to be careful to keep everything minimum to create minimalist theme that still stylish and useful. For you who need some ideas to be used in your house design, here are some inspirations that you can try to follow. For the minimalist home design colors, you will be able to use basic and neutral color for all walls in the house. Neutral colors that you can use are white with black combination which already becomes a signature color of this theme. You can also use basic color such as natural colors and metal colors. Mix and match your furniture and other decoration item that has those natural and metal colors. These color combination will make the minimalist design feels warmer even though most people think that minimalist theme is cold because it is too simple. Simplicity should be applied in every area of your design, especially on the minimalist home design lines. The lines on your design should be clean, try to have as minimum curve as possible or even no curve at all. This should be applied on the exterior lines, interior lines as well as furniture lines even when something have to had a specific shape, it should have clean lines such as rectangular. With clean lines all of your design will feel pleasing to look by keeping this simple signature of minimalist theme. If you think those ideas are too simple for your taste, we will know talk about the minimalist home design arts. For the arts you can use any kinds of colors and style since this art should be the point of interest in your house. This is an aspect of minimalist theme that you can be free at, even though you might want to keep them in high art aspect. If you need to frame the art, you will still need to use frame with natural color and simple lines to still put the minimalist characteristic in the arts you use. To keep everything minimal, you need to be able to see everything easily. This also means no barrier in the house including room separator. Try to create open layout in your house to keep everything in one room. Of course if you need some privacy you can have your own private room, but the other common room should be open. This will make the family interact easier since everything is done in the same room no matter what you do. That might be one of the reasons why people love to use minimalist home design for their house. Every house need some greenery in their interior to make you feel relax. Some even love to have flowers but if you truly want to keep the minimalist theme then you might want to consider other plant type. The minimalist home design plants that you can use are succulents and cactus since they are more suitable for the minimalist theme. Moreover they are easy to maintain and does not need a lot of waters which make it suitable for indoor plants and busy lifestyle that you have. Put them in beautiful minimalist pot to accessorize your interior. For you who want to use minimalist theme, then you should be able to organize everything perfectly. Invest in a storage system that could give you extra space to store all items and organize it for easy usage and find. Try not to use a lot of useless items, if possible try to use item with multiple usage such as multipurpose furniture. This will greatly save the space use and make your life easier by using functional items. Make sure that the rooms are always clean since it is another signature of minimalist theme and a lifestyle that you should have. Those ideas are also be the reason why minimalist home design is suitable for small house. This theme will be able to save more space in the small house and use available space as efficient as possible. Lighting is also important part of minimalist design that you should pay attention to. Try to have every room lights up perfectly and do not forget that you can use artistic fixture as a form or art that you can use to decorate the house. If you love technology then minimalist theme is perfect for you since appliance has suitable style that match with minimalist style.